Approximately 160 Calgarians gathered at Samaritan's Purse to pack 1,800 care packages bound for Nepal. As weary earthquake survivors in Nepal adjust to living in the streets of Kathmandu, survivors in rural areas are the ones most in need of help, according to a Nepalese couple now living in Calgary. Ganga Karki and her husband Bandhu Adhikari both worry about their families after the South Asian country’s two devastating quakes, but their struggles are nothing compared to those faced by survivors in rural areas, the pair said. 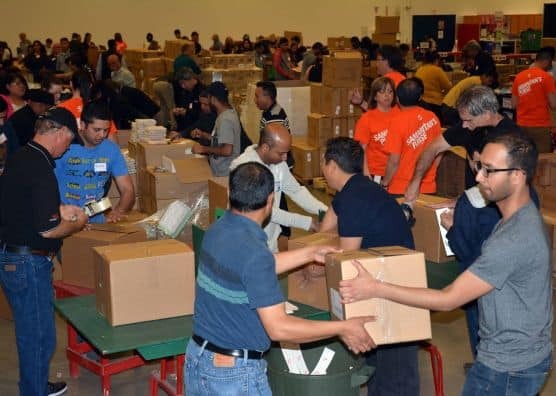 The couple took part in a Samaritan’s Purse event Wednesday night that saw approximately 160 Calgarians gather to pack care packages for shipment to Nepal. Packages contained a variety of items for women, children and men, including children’s books, shampoo, wooden spoons and menstrual pads, among others. 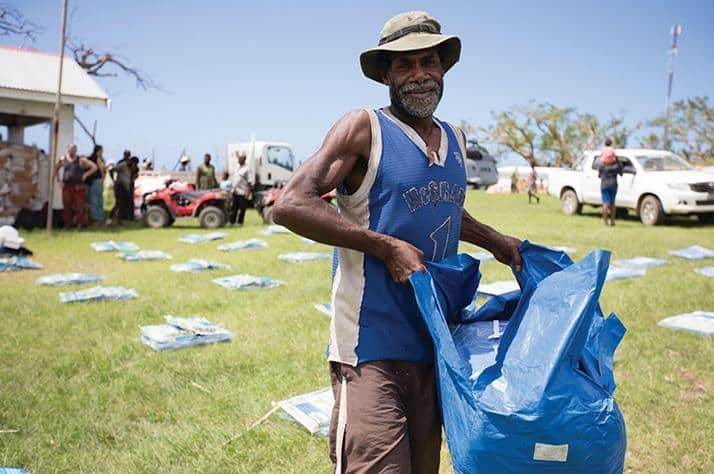 The couple hopes the care packages make it to desperate, rural farmers who don’t yet have adequate shelter-let alone food-for the looming monsoon season, the couple said. “We have a shipping container here that we’re going to fill and seal it when we’re done. It will ship to Nepal this week,” said Brent Davis, a disaster response manager with the organization. Samaritan’s Purse has one central operation centre in Kathmandu and six forward operating centres in rural areas. Those six centres are on the front lines for delivering recovery and aide supplies, Davis said. Assembling and delegating work in a massive, brightly-lit warehouse, volunteers moved spryly down long production tables, gathering items and packing individual cardboard boxes as they moved. At each end of the three tables, volunteers stacked the boxes onto wooden pallets for the shipping containers. At the end of the three-hour event, approximately 1,800 packages were finished and ready for shipping, said spokesman Frank King. He encouraged people wanting to donate to do so before May 25; up until that date the federal government will be matching all donations to Nepal, he said. For their part, Karki and Adhikari hope the packages arrive as soon as possible, especially because quake survivors have yet to see significant help, they said. “People are dying and they don’t have food; they’ve lost everything. People are doing what they can themselves, because the government isn’t helping,” the couple said.